KHARTOUM, Sep 15 2012 (IPS) - In Sudan’s newspaper district in Khartoum East, dozens of people sit beneath the trees sipping tea or reading newspapers. Most are journalists who once worked for the 10 newspapers that were either forced closed by the country’s security services or because of economic constraints that resulted after the government raised printing taxes in an attempt to prevent the media from reporting on anti-government demonstrations. Mohamed Ahmed, a former journalist for the Ajrass Elhuriya newspaper, which was closed in July 2011, is one of them. The Sudanese Network of Journalists, a union for reporters, estimates that about 200 journalists are currently unemployed by the closures, which, it says, is the highest unemployment rate the profession has seen. The crackdown against the press began more than a year ago, soon after Sudan and South Sudan separated in July 2011. More than 10 journalists were reportedly arrested and tortured by the police before and during nationwide anti-government demonstrations in June after the implementation of a government austerity plan that scrapped fuel and commodity subsidies. In addition, security services have been accused of preventing 15 reporters from publishing stories on the demonstrations. On Sep. 9, the general court in Khartoum north upheld the closure of a local newspaper, the Rai Elshab, and fined it for breaching the “duties of the press” and for “starting sectarian strife” after it published a story about rebel forces fighting the government in the country’s volatile western region of Dafur. The war between the rebel forces in Dafur and the Sudanese government has raged since 2003 when the Sudan Liberation Army and Justice and Equality Movement (JEM) began attacking government, accusing it of oppressing black Africans in favour of Arabs. Since 2010, the warring factions have been in peace talks. However, fighting has continued in the region, with the most recent incident occurring on Sep. 6, which resulted in the death of 10 government soldiers. The country’s National Intelligence Security Services (NISS) had closed the Rai Elshab newspaper in January, and owners had gone to court in an attempt to have the publication reopened. However, the judge ruled that the paper would not be allowed to publish again without NISS approval. The Sudanese Network of Journalists told IPS that in the coming weeks the organisation would lay a complaint against the Sudanese government with the United Nations Human Rights Council in Geneva. According to one of the organisation’s leaders, Khalid Ahmed, the complaint will be made once all national and regional mechanisms to put pressure on the government for a free and fair media had been completed. 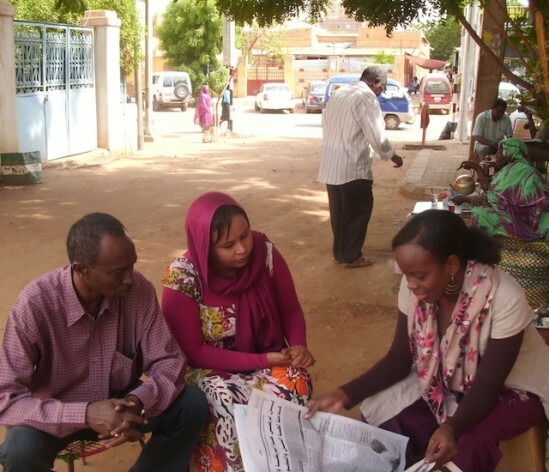 In July reporters protested against the censorship at Sudan’s Human Rights Commission to no avail. Khalid Ahmed said that the network’s last memorandum to the Human Rights Commission in Sudan had been submitted on Jul. 4 and called for the cessation of censorship and the release of journalists in police custody. “They didn’t reply to our memorandum as we’d expected, but we will continue on our mission to complain to the U.N. Human Rights Council in Geneva to set the media here free,” he said. Faisal Mahmed Salih, the former chief editor of the now-closed Eladwaa newspaper, and the head of Teebba Press Center, told IPS that the censorship had negatively affected the media’s role in disseminating information. Political analyst Hafiz Mohamed told IPS that the crackdown against the press would have a negative effect upon democracy and any possible political reform. “Freedom of expression is a basic part of the democratic process, included with other freedoms such as freedom of assembly and association. If the government forbids journalists and the media from doing their jobs, there will be no democracy in Sudan,” he said. He said that the censorship would only end if the circumstances changed. “Our country has special circumstances, because we are in a war with rebel groups and the media has to be careful,” Abdallatee said. He said that the newspapers closed by the NISS, which are yet to be charged, “published negative articles, and threatened our national security” and were being investigated. Osman Shinger, the chief editor of Eljareeda newspaper, told IPS that his publication had been to court 15 times during the last two months because of an arrest warrant against him. Shinger was charged after the publication of an opinion article criticising the governor of Sudan’s Al Jazirah state. “I think that all the Sudanese problems are relevant to freedom of expression and access to information,” Shinger said. Meanwhile, some journalists who were arrested and subsequently released now face ostracism from other publications practising self-censorship. Mohamed Alasbst, the former managing editor of the Al-Ahram daily newspaper, spent two months in prison because he aided the now-deported Egyptian journalist, Shymaa Adil, who was covering Sudan’s nationwide protests for the Egyptian Elwatin newspaper. She spent two weeks in prison. He told IPS that because of his stint in prison, newspapers will not hire him for fear of being targeted by the government. Alasbst added that his own newspaper fired him after he was released from prison. The difficult situation has resulted in some choosing to quit the profession altogether. Mohamed Ahmed told IPS that he has decided to leave Sudan to find work in one of the Gulf states.